The Vanderbilt University Institute of Imaging Science supports advances in physics, engineering, computing, chemistry, and other basic sciences for the development and application of new and enhanced imaging techniques to address problems and stimulate new research directions in biology and medicine in health and disease. Services: The CCI provides resources for researchers that alleviate the training and expertise required with traditional package-based image processing solutions. In addition, we work with researchers to create project-specific tools to extend analysis capabilities. Infrastructure: The CCI develops, maintains, and supports software and hardware solutions that contribute to streamlining data storage, retrieval, analysis. Research: The CCI is active in many projects to develop and apply novel image analysis and informatics techniques to a wide variety of research areas. he Center for Computational Imaging (CCI) provides solutions and services aimed to make imaging research more tractable to members of the scientific community. The CCI works with researchers to provide services, training, and guidance for image analysis and informatics. The CCI develops support tools, informatics tools, and infrastructure, to help advance imaging research for the center's user, collaborators, and the medical imaging community. Services and Support - The CCI provides services and support to facilitate research using imaging data. The CCI works with investigators through all stages of a study such as planning, data processing, and data analysis. Software Development - The CCI develops and supports software libraries to integrate a diverse package of data analysis tools and sample data. This includes common data analysis tasks (e.g. fMRI pre/post-processing, DTI processing, VBM etc.) as well as project-specific solutions. Research Database - The CCI maintains a multi-terabyte research PACS (picture archiving and communication system) as a central storage mechanism to archive and maintain imaging data. VUIIS Cluster and Workstations - The CCI maintains and supports a multi-node processing cluster and a group of advanced workstations configured for imaging data analysis. Image Resources - The CCI seeks to encourage, support, and facilitate data sharing efforts and inter-investigator/inter-institutional collaborations. Breadth of Chemistry (rational design, combinatorial chemistry, diversity oriented synthesis, automated sequential organic synthesis, microwave assisted organic synthesis, peptide synthesis, phage display, repurposing, high-throughput small molecule screening, microfluidics) and Molecular Biology (traditional and mass-spectrometry proteomics and phospho-tyrosine proteomics, proteomic arrays, q-RT-PCR arrays, microarray, histology, traditional and	immunofluorescence, primary human tissue xenografting) techniques employed. Integration of all Molecular Imaging modalities (2D and 3D optical, high-resolution ultrasound, MRI, autoradiography, PET, SPECT). The major objective of the Center for Molecular Probes (VCMP) is to develop new molecular imaging tracers non-invasive visualization and quantification of specific molecular events in cancer cells and other diseased tissues. Though activities of the VCMP span multiple modalities, primary efforts of the center are aimed at developing novel radiopharmaceuticals for positron emission topography (PET) imaging. Among clinical modalities available for molecular imaging, the sensitivity and quantitative nature of PET, coupled with the ability to produce biologically active tracers bearing positron-emitting isotopes, renders PET imaging uniquely capable of detecting diseased tissues and profiling their molecular features. Despite this potential, a lack of specific, and biologically validated tracers able to provide detailed molecular information about individual tumors limits the breadth of biological questions addressable with PET. The fruits of VCMP programs are critical to the delivery of precision medicine in oncology and other human diseases. Distinguishing features of the CMP include the interdisciplinary, 'flask to first-in-humans' approach we take to accelerate tracer discovery and translation and the major emphasis placed upon developing PET tracers for oncology applications. The VCMP operates state of the art facilities to support tracer discovery, validation, and translation to patients and supplies all of the research PET tracers for clinical trials at Vanderbilt. We operate both discovery and preclinical production facilities, as well as a cGMP-compliant PET tracer production facility to support clinical investigations. The VCMP supports the development and maintenance of Investigational New Drug (IND) applications and currently holds, as institutional resources, multiple INDs for Investigational PET radiopharmaceuticals. We also have available molecular biology and connected laboratories that are well equipped with modern instruments for work including isolation, purification and determination of DNA, cloning, protein purification. In conjunction with the synthetic chemistry laboratories, the VUIIS oversees a total of 4 distinct laboratories setup for the exclusive purpose of radiopharmaceutical and radiochemical preparations. The Radiochemistry Core, which is located immediately adjacent to the VUIIS building and connected to VUMC Human PET Center, is currently supplied with radioactive isotopes from two separate negative-ion cyclotrons; a CTI/Siemens RDS-112/00 and a recently installed GE 130 uA PETtrace cyclotron. Tracers that predict response to therapy. In addition to cancer, major research efforts are currently aimed at neuroscience, diabetes, and cardiology. 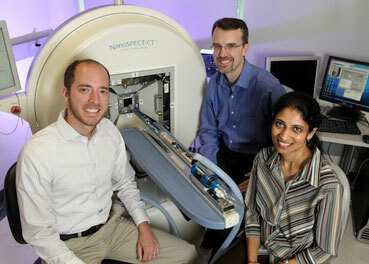 An interdisciplinary team focused on high performance imaging. Research at VUIIS aims to push the boundaries of resolution, sensitivity, and accuracy of non-invasive imaging techniques. Access to state of the art imaging equipment, fabrication facilities, and computational resources. Investigators can efficiently design, simulate, implement, and evaluate new approaches to biomedical imaging using these resources. Vibrant programs in small animal and human imaging leverage the translational potential of imaging in biomedical research. Imaging Physics is the application of physics and mathematics to problems in biomedical imaging. It includes research in image formation, contrast mechanisms, and scanner design. Imaging Physics at VUIIS includes MRI pulse sequence design and image reconstruction, the development of novel sources of contrast in MRI and ultrasound, and detector optimization in SPECT. Other research at VUIIS is focused on developing models relating basic physiological quantities to image variables, providing more useful information from imaging experiments. Imaging Physics research at VUIIS is carried out on a wide range of state of the art equipment. A 7 Tesla human MRI scanner, one of only about 30 in the world, provides a platform for studying contrast mechanisms and system optimization at very high field strength. Six additional MRI scanners for humans and/or small animals are optimized for a variety of experiments. Electronic and machine shops in VUIIS support fabrication of novel scanner components. Computational resources include a cluster in the Institute. In addition, the University’s high performance computing cluster (ACCRE) is available for demanding image simulation and analysis projects. Development of very high field MRI, including correction of static and radio frequency magnetic field inhomogeneities. Applications include high spatial resolution studies of brain structure, function, and pathology. Measurement of tissue anisotropy and neuronal connectivity in the brain. Mathematical modeling of water diffusion in tumors as a probe of the tissue microenvironment. Multicompartment modeling of magnetization exchange. Improved sensitivity of magnetic resonance spectroscopy (MRS) using spin hyperpolarization. Three dimensional elastography for breast imaging. Optimization of SPECT camera spatial resolution. Optimization of three dimensional radiation dosimetry. Access to state of the art equipment covering a full range of imaging modalities enables a broad range of measurement capabilities. High level of expertise, including MRS/MRI pulse sequence design, molecular probe design and synthesis, protocol development and implementation, and translational studies. Vanderbilt is a well established center for research in metabolism, diabetes, cancer and obesity, providing opportunities for collaboration and translation. Metabolic imaging and spectroscopy (MIS) refer to the use of non- or minimally invasive imaging and spectroscopy methods to characterize metabolic processes in vivo, as well as the processes that stimulate and support metabolism. MIS research at VUIIS is directed in part toward technical advances: interest areas include novel MRI and MRS techniques, such as pulse sequence development and the use of isotopically enriched tracers to probe metabolic events in vivo. Such tracers often termed biomarkers are utilized in their conventional form as well as using short-lived hyperpolarized metabolic contrast agents; the design, synthesis, and use of contrast agents to measure metabolism and related processes; and understanding physiologically derived contrast in images. Other MIS research at VUIIS is focused on applications in human disease and applied physiology; areas of interest include neurochemistry, cancer, diabetes, and neuromuscular and rheumatic disease. Metabolic imaging and spectroscopy research at VUIIS is carried out on a wide range of state of the art equipment. Instruments for human studies include one 7 Tesla and two 3 Tesla MRI/MRS systems; near-infrared optical tomography and spectroscopy, suitable for studies of blood volume and oxygenation responses to brain or muscle activation; and PET imaging. Facilities for small animal studies include five MRI/MRS scanners ranging from 4.7 T to 15 T (near future) with multinuclear and in vivo cryoprobe (near future) capabilities; PET and SPECT; X-ray computed tomography; ultrasound; and optical imaging. Hyperpolarized program capabilities include two low-filed MR systems/polarizer, parahydrogen generator and xenon polarizer (under construction in collaboration). Electronic and machine shops in VUIIS support fabrication of novel scanner components. Chemistry lab for production of short-lived hyperpolarized contrast agents for real time metabolic imaging. Computational resources include a cluster in the Institute. In addition, the University’s high performance computing cluster (ACCRE) is available for demanding image simulation and analysis projects. Microstructural and metabolic characterization of inflammatory myopathies. Assessment of structure-function relationships in muscular dystrophy. Assessment of skeletal muscle macro- and micro- vascular function in obesity and diabetes. Development of imaging methods for glycogen quantification. VUIIS is undertaking diverse research projects in neuroscience, developing advanced methods for probing the structure, metabolism and functional architecture of the brain, understanding the basis of their information, as well as applications across a spectrum of disorders. VUIIS provides unique opportunities for studies across species, from mouse to man and including brain imaging in both awake and anesthestized non-human primates. VUIIS combines an array of technologies - MRI, fMRI, DTI, MRS, phMRI, PET, SPECT, optical imaging, electrophysiology (EEG, ERP) - for brain studies, including the opportunity to image the human brain at ultra-high field (7 Tesla). The Neuroimaging research program within VUIIS spans a wide range of technical development, scientific questions and applications in both basic and clinical neuroscience. Advanced methods are being actively developed to study the brain, particularly using magnetic resonance imaging (MRI) and spectroscopy (MRI). For example, blood oxygen level dependent (BOLD) imaging is being used to map the functional architecture and connectivity of brain circuits, while the distribution of and kinetics of important neurotransmitters are being assessed using multinuclear MRS. Diffusion tensor imaging (DTI) provides unique information on the tractography of white matter, while alternatives to BOLD such as perfusion (from arterial spin labelling) and volume measurements are also available. Quantitative morphometry of brain structure makes use of high resolution MRI data, and the construction of brain atlases allows comparisons between groups and correlations between structure and other attributes. Variations in the structure, metabolism and function of the brain are being used to understand and characterize a spectrum of neurological, psychiatric disorders, developmental and degenerative disorders. Fundamental studies of brain organization are greatly aided by our unique program studying non-human primates, while the design and actions of various neuroactive drugs make extensive use of our program in pharmacological MRI and PET. The various activities in neuroimaging are greatly enhanced by the close collegial collaborations that exist between VUIIS personnel and investigators in other departments, notable in Psychology, Psychiatry, Neurology, Neurosurgery, the Kennedy Center and Peabody College. For human imaging, VUIIS operates two 3T research-dedicated Philips Achieva MRS/MRS scanners, as well as a 7T Philips Achieva human MRI/MRS scanner. All are capable of performing fMRI and multinuclear MRS. A Mock MRI scanner for conditioning subjects, along with a Hitachi NIR Optical topography system and 64 channel Neuroscan ERP/EEG, are immediately adjacent to the MR suites. A microPET (and microSPECT) scanner, along with high field MRI (4.7T, 9.4T), are available for studies on animals including a 60 cm, 4.7T vertical bore system for studies of awake, behaving non-human primates. Human PET research studies are performed in the Vanderbilt Department of Radiology. The VUIIS PET Radiochemistry Research Laboratories provide a range of isotopes for human brain studies including [18F]fllypride (to image dopamine D2/D3 receptors), [18F]setoperone (serotonin 5-HT2a receptor), [18F]altanserin (serotonin 5-HT2a receptor), [18F]FDTBZ (vesicular monoamine transporter), [18F]FECNT (dopamine transporter) and [18F]FPEB (mGluR5, metabotropic glutamate receptor). Ultra-High Field MRI and MRS of Human Brain. Studies of Functional Connectivity Using High Resolution fMRI. Improved Imaging of Brain White Matter. Quantitative MT Imaging Development and Application.